All properties belong to Nintendo. It's fanmade and will never be mass produced or used for commercial purposes. What size of safety eyes that you used? It's almost like he is saying: please hug me! awwww, do you have the pattern? ;w; is there any way you could sell this!? My daughter (20m) is sitting here squealing and clapping, screaming CHAR-MAN-MAN-DUR CUUUUUTEEEEE!!!!! CHARRRRRR-MAN-MAN-DERRRR!!!!! Awwww!~ With his arms out like that, he looks like he's asking for a hug. Hewwo, sir. Will you wuv me? Adorable! I WANT!!!!!!!!!!!!!!!!!!!!!!!!!!!!!!!!!!!!!!!!!!!!!!!!! how much are they? 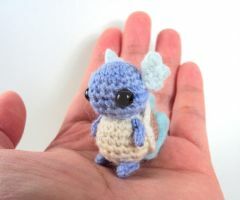 Can I commission one of these/is the pattern available? 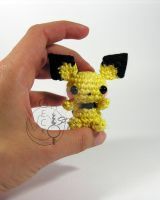 You got so much pride in knitting Pokémon! "Crocheted"? I never heard of that before, but it does look like hard work. Heh. Keep up the good work. 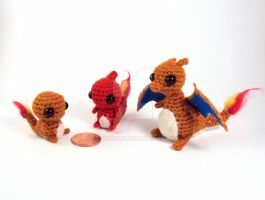 one question.......will you sell the pattern to these cute pokemons? id like to have one.. how much are they? Definitely do magikarp! Also, do you have an on-line shop, like etsy?